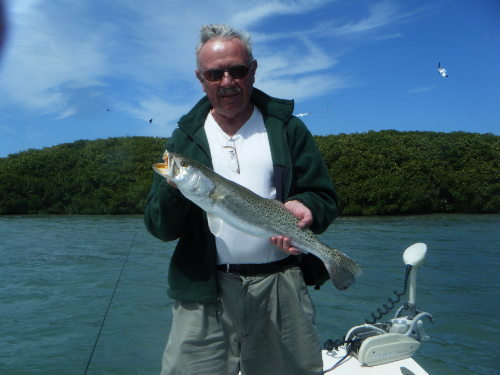 A Trout Fishing Charter is one of Florida’s true fishing pastimes. Not only is it great fun to catch a good batch of fish for a cookout but it is a favorite for a day of Family Fishing. It makes for a great day to just letting the kids have tons of fun. Now don’t get me wrong because most of these kids are 30, 50, even 75 years old and if you want to really have fun and get lots of laughs this is a Charter you’ll want to book for you and your Family. Trout are a beautiful silver fish that’s loaded with black spots along with hues of purple and blue on its sides and a mustard colored mouth full of very sharp pearly whites. In the sunlight they have same beautiful colors and like the rainbow trout up north. However, as you probably heard, looks can be deceiving. These ferocious feeders will attack with furry and bust your bait or top water plug like a much larger fish. They are such vicious feeders that they have even been known to eat their young…so don’t let their beautiful smile fool you. Although they don’t get very large they make up for it in tenacity and larger numbers. Ranging in size from 1- 3lb. average, monsters in the 10, 12 even 14 lb size have been caught. Some will give you a fight to make you even think you hooked a Snook. I’s not uncommon to catch as many as 40-50 trout in a half day inshore fishing charter. The Florida Gulf Coast is loaded with plenty of Trout and you will usually find them mixed in with Snook and Reds on the grass Flats. The best time to catch them is the winter months but they are still plentiful year around and just great fun anytime. Call Capt. Kevin Walton Today and Book IT. Call 1-727-638-0975 Today!